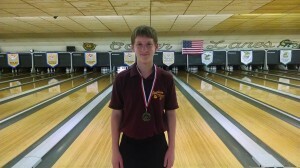 Rodney Hoover a Sophomore from Davison High School bowled his first 300 game in a high school match at B’s Bowling on Wednesday, January 14th, 2015. Davison was bowling a Saginaw Valley Conference match against Flint Southwestern, a match that Davison went on to win and move to 5-0 so far on the season. Rodney’s first game led the team to an 1153 actual score the first individual game. Rodney finished up the match with a 191 game for a 2 game series of 491. Congratulations Rodney! 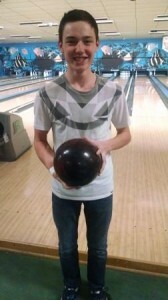 Chad Stephen is a Sophomore at Kearsley High School and has been on the Varsity Bowling team for the last 2 years. He experienced a State Championship last Spring when the Kearsley Boys team won their first ever State Championship, but nothing can compare to what he experienced in early October at B’s Bowling in the Tuesday Scratch League. Chad had just recently purchased a new Storm HyRoad Solid bowling ball from Bart Rutledge at the Bowlers Advantage Pro Shop at Grand Blanc Lanes and anyone that knows Chad knows that he has been out practicing a lot with his new equipment, trying to get prepared for the upcoming high school season. Well Chad started his Tuesday league out on lanes 3-4 at B’s Bowling with some strikes and spares and ended up throwing the last 4 strikes the first game to finish with a 217. What came next was amazing and even surprised Chad. He continued to throw strikes when he moved to lanes 5-6 and ended up shooting a 300 game his 2nd game but it didn’t stop there, he continued to strike when he moved to lanes 7-8 for game number three and he finished off his third game with another 300 game. He finished his first 3 games with 28 strikes in a row and his first 800 series with an 817. Chad is the 4th person in the history of Flint Junior bowling to bowl back to back 300 games joining Jason Howard, Matt Anderson, and Tylor Greene as the only other Junior bowlers to accomplish this feat. 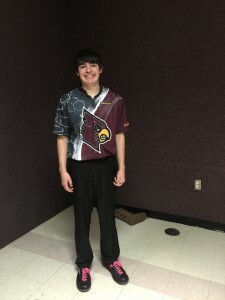 Chad finished last season with a 225 league average and he is currently averaging 220 in the Tuesday Scratch League and it’s pretty safe to say he is ready for high school bowling to begin. Congratulations Chad! for donating the awards and for printing up the booklets for Youth Hall of Fame. Allison Scully was a member of the Greater Flint Youth Bowling program for 10 years and participated in high school bowling all four years on the Varsity Team at Davison High School. She has a youth high average of 195, high game of 288 and a high series of 680. 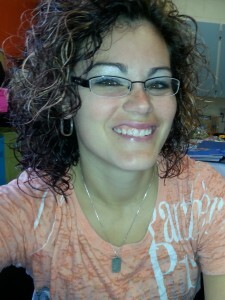 She was a member of the Davison High School varsity bowling team. She was voted team captain of the Davison High School team all four years that she participated. Allison finished in the final 4 of the MHSAA state finals in the singles competition in the 2003-2004 season and finished in 5th place in singles in the 2002-2003 season. She was also an All State selection for the 2003-2004 high school bowling season. Allison was a member of the Greater Flint Youth All Star/Invitational Team all four years of her high school career. She made the All City Team seven times during her junior career and she was the captain of the All City team two times, in 2000-2001 and 2004-2005. She also won a scholarship in the City Mixed Doubles Tournament in 2004-2005 season when she won the open division. After her high school career, Allison accepted a scholarship to attend University of Central Missouri for bowling. She is believed to be the first bowler from the Greater Flint Area to ever receive a scholarship for bowling at a major university. At UCM, Allison got to bowl for an NCAA national championship all four years of her collegiate career. Allison also participated in Big Brother/Big Sisters bowling fundraisers and helped coach the youth bowlers at Rollaway Lanes from 2000 through 2005. She also coached youth bowling in college in Missouri for a few years. Being inducted into the youth hall of fame is an honor. I feel privileged to now be with some of the greatest bowlers in the Flint area. Spending my entire youth participating in the Greater Flint Youth Bowling Association was a memorable experience. To be inducted into the Youth Hall of Fame would mean the world to me to show all aspiring young bowlers that dedication, hard work, and determination will pay off and result in wonderful achievements. Congratulations Allison and welcome to the Greater Flint Youth Hall of Fame! 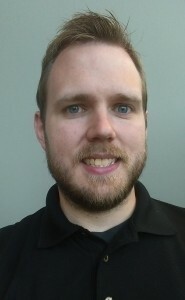 Scott Fisackerly was a member of the Greater Flint Youth bowling program for 12 years and participated in high school bowling for 2 years on the Davison Varsity Bowling Team. Scott has a high average of 201, a high series of 749, and a high game of 288. Scott was a member of the Davison High School team that won the Big Nine Conference Championship and was named 3rd team All Conference for the Big Nine Conference both years he bowled high school. 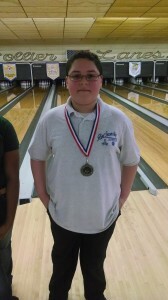 He qualified for the state finals with his team both years he bowled high school. He was also named All State Academic his senior year of high school. Scott was a Michigan State Doubles Champion and he qualified for the All Star/Invitational Team 3 years in a row from 2005 to 2007. Scott was also a City Singles Champion in 2004 and won the $500 Greater Flint Youth Scholarship in 2006. He was a member of the All City team 7 times and was named the captain of the All City Team for the 2003-2004 season. Scott was the Bantam high average in 1998 for the Greater Flint Area with a 128 average. Scott also served 2 years on the Greater Flint USBC Board of Directors and coached the JV boys team at Davison for 3 years after graduation. More recently Scott has been involved in helping to start and keep the Greater Flint Youth Hall of Fame going for the last 5 years. For more than 12 years since I first picked up a bowling ball I have been involved with the game in the Greater Flint area. To say that it is a major part of my life would be an understatement. Through bowling I’ve grown to know many people and have met my best friends through the game. When I made the decision to become a high school coach, it was to give back to a game that had given me so much throughout the years, and as a way to keep involved in the youth programs that had become my home, even as I progressed into the adult leagues. To be inducted into the Greater Flint Youth Hall of Fame would be an overwhelming honor to me, as it would represent everything I had done as a youth bowler in the Greater Flint Area and be a final award from the game that has become much more than a hobby, but a lifestyle. Congratulations Scott and welcome to the Greater Flint Youth Hall of Fame! 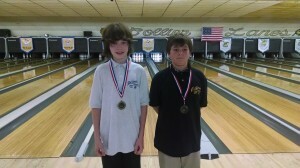 Jacob Porter qualified 10th overall on the boys side of the Flint Metro Conference Middle School Singles Championship Tournament that was held at Collier Lanes in Oxford on May 17th, 2014. 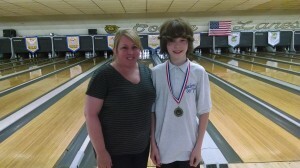 Jacob won his first match against Justin Defoe and then defeated Max Murphy with a 254 game with handicap. In the final 8 Jacob defeated Justin Linn with a 180 game and in the final 4 Jacob defeated Corey Ehrmantraut with a 254 game. In the finals Jacob Porter defeated Justin Sisson by a final score of 153 to 141. Congratulations Jacob! Matayas Makranyi from the Flint Scorpions was the high qualifier of the tournament with a 674 total. 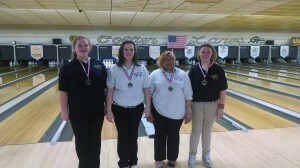 Madison Ellington from Oxford started the day off by qualifying 4th overall in the 4th annual Middle School Singles Championship Tournament that was held at Collier Lanes in Oxford on Saturday, May 17th. After qualifying 4th, Madison won her first match with a 231 game with handicap, then won her 2nd match in the final 8 against Ryanne Rhoades with a 221 game with handicap. 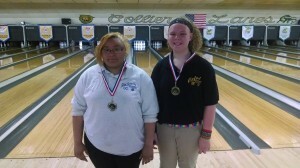 In the final 4 Madison defeated Jacqlyn Davis with a 201 game with handicap and in the finals Madison defeated Tionna Haddix from the Flint Infinity by a final score of 204 to 172. Pictured above are Tionna (on the left) and Madison (on the right). Congratulations girls! Imari Blond from the Flint Storm was the high qualifier on the girls side and also had the high game of the day for the girls with a 257 game with handicap, congratulations Imari. 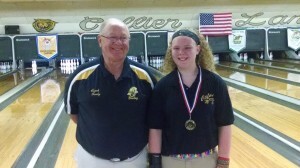 Madison Ellington, tournament champion shown with her coach.